And who wouldn't be? I mean, who can resist naked ladies holding swords? I'm not complainin' mind you, but this might be a more interesting photo from the other side. Had this "naked lady" been to a football game? ... instead of him (NTTIAWWT). Schade - Did I see Siouxie's machete on the far side of that group? Speaking of football, I didn't have a dog in this fight, but Georgia Tech just upset Georgia 45-42, and I like upsets. I like naked ladies holding my sword. Meanwhile, Florida-Florida State, in the rain; it doesn't get much better than that (naked lady holding my sword, being the exception)! Must be DC, Bob has a wide stance (NTTIAWWT). Siouxie, put that machete down and put some clothes on, you'll catch your death of cold out there! What is Dave doing in Washington?? He LOST!! AGAIN!! /Is it a coup attempt? I'll bet it's a coup attempt. He's got the Lawn Rangers ready to attack!!! Then again maybe he was trying to tell him to get her this fantastic gift before it was to late. Bob just doesn't want Norm getting too excited as he watches her practicing her sword swallowing. 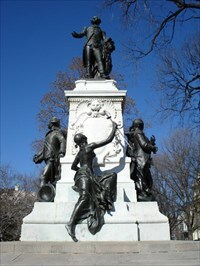 For the record, the statue is of the Marquis De LaFayette, in LaFayette Park. The naked lady represents the American colonies; Norm and Bob are Frenchmen, discussing surrender. Dave is in D.C. overseeing his Transition Team prior to the Inauguration. Looks like Bob is reaching for Norm's John Hancock, IYKWIM. Actually, Lafayette has misplaced the remote yet again, and the clothing-challenged maiden is helping him out. Note more guys on the other side of the statue just hanging out whilst the woman gets it done. We've come a long way, booger. He was just trying to stop him from shopping in Wal-Mart, or Toy-R-Us. And a good thing he did, too. Maybe we'll get a column about DC, so Dave can write off the trip. Whose sword was she holding? Ladies aren't supposed to have swords. "The only president that never married. The White House hostess was his niece, Harriet Lane. In 1819, Buchanan became engaged to Ann Coleman. A misunderstanding took place and their engagement was broken. A short time later, Ann died. Buchanan vowed he would never marry." a) What does this have to do with Marquis De LaFayette and/or naked sword wielding ladies? b) Are our NPS interpretive writers learning? that was back when presidents kept promises! Dave, you're scoping out locations for the next Hunt, aren't you? Do I need to start Googling everything I can find about naked ladies with swords? Because frankly, I'm not too sure I like the idea! Lol, afkat. That's my life except the pile of laundry in that vid is way too small. To think that I let the real estate agent tell my my house was nicknamed the Augean Stables because we were horse-country adjacent. 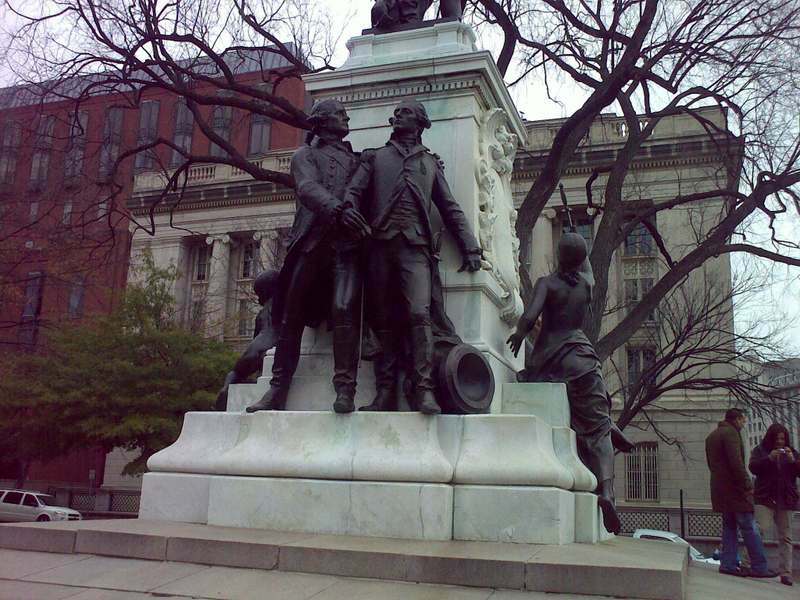 Re the statue: Let's see...Reid, Frank, Pelosi. Wait, Pelosi needs a little more work done first. Renee, next Hunt is in Washington. I'm going. Let's meet up again! See you there, Jan! And this time make sure to eat only peanut butter sandwiches that you've packed yourself, or something equally harmless. ;-) I want you to be able to have fun this time! Naked ladies with swords are cool, I met one on Hollywood Blvd on a Thursday evening in 2005, OK, she was nearly naked, unfortunately she wanted money before she would allow me to take a picture of me and her together. Mot, learn from Afkat; cash or diamonds. she is sneaking up on them.... maybe a shady naked lady? YAY! woman with a sharp object!! !